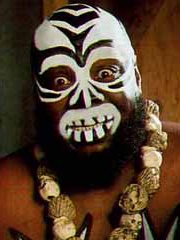 Today we take a look at a wrestler who was feared and thought to be a real life cannibal: Kamala. He was billed from Uganda and was considered to be a major threat as a heel wrestler, having big time feuds with Jake Roberts, Jerry Lawler, Sgt. Slaughter, and The Von Erich family. He would really put people in seats with his character, as his style was all about being an opposing bodyguard-like figure and would tap his belly in a savage way. His moves consisted of backhand chops, headbutts, manhandling, and his finisher had many names; Air Africa, Kamala Splash, Uganda Splash but it was really a Big Splash. The kayfabe of Kamala consisted of never speaking English in public and wearing tribal garbs. Even on camera, he would make primal, animalistic noises. There's even a promo of him eating a live chicken. Personally, I feel he brought out a fascination with the foreign (as is done by most wrestling heels to the average wrestling fan), more so than The Iron Sheik or the original Von Erich family, because he was someone that could view you as a meal, and really did look like a monster with his face paint. Kamala kept at his act for years, thus making the fine line of fantasy and reality hard to tell with this guy. I can't really find anything truly noteworthy in terms of showing off footage, but regardless, he's a legend. Also, this may be viewed as a stereotype but can the phrase ever be said, "it was a different time then," for anything in wrestling? Well, you can't hush up the past, in my opinion, and we honor Kamala as a Monster of Wrestling.